Enjoy our Refined & Rustic 3 bedroom cabin w/ gated spa deck w/ BBQ, rock fireplace, full kitchen, free wifi, and movie channels. The cabin is within walking distance to the ski lifts (summer- mountain biking & hiking; winter- snowboarding & skiing), zoo, golf course. Near recreational Big Bear Lake for fishing, boating, & jet skiing April-Oct, with restaurants, rentals, shopping centers, movie theaters just down the road, but out of sight of this cute cabin in the trees set back from the road. Convenient fun with a quiet place to rest your head and relax. Winter is a great time for your family or ski party to discover the Apple Jacks Cabin. Its bright green exterior is a vivid contrast to the snow that covers the wide open spaces that separate Apple Jacks from neighboring cabins. Handsome, rugged log railings circle the Trex deck, and a six-foot wood screen provides additional privacy for the large spa on the back deck. Half-log trim around all the doors and windows complete this picture-perfect cabin. There is lots of space for parking in the front along with a parking spot that is flat with the road making it easy for cars to get in and out when it is snowing. Set back far from Deer Canyon Road, Apple Jacks will make you feel like you have stepped back 20 years to a more serene Big Bear before it was discovered by Southern California as the perfect alternative to Aspen or Vale. Imagine walking to the ski lifts at Bear Mountain Resort without having to rise at dawn to find a parking space in the resort’s main parking lot. No longer will you have to be herded like cattle in those open flat-bed trucks from distant auxiliary lots. You can also walk to the nearby Moonridge Animal Park to visit the inhabitants of the surrounding San Bernardino National Forest. Step inside its original diamond-paned front door and you will be in the spacious Apple Jacks great room. It features T&G wood ceilings, supported by large, rugged beams. You’ll also find a large, flat-screen television, with access to numerous cable channels. Two sets of French doors take up one wall of the great room and lead out to the large back deck with its spa, wood picnic table and BBQ. To the right of the great room is the dining area and the fully-equipped kitchen. Let Mom relax in front of the large, flat-screen TV with a glass of wine while Dad and the older kids prepare dinner. You can even keep one eye on the young ones, who will want to head outdoors whenever they can. The front deck and the vacant lot next door are right outside the kitchen windows. When it's time for the rest of your family or group to bunk down after an active day, Apple Jacks can officially sleep five adults and three children in its two bedrooms and converted den. The master bedroom has a king-size bed, with a balcony overlooking the deck and spa. There’s also a TV, DVD and CD player tucked behind the sliding doors of the closet. The second bedroom contains two full-size beds with 'picket-fence' headboards that will delight the kids. Downstairs, a former den has been converted to a third sleeping area that holds another full bed. There's probably some guests who couldn't come up the mountain without a laptop, or have to do some real work to make the trip tax-deductible. Free wireless high-speed Internet access is available throughout the cabin. A special movie channel package has been added for the snow bunnies who prefer the indoors to the slopes. There's also unlimited US & Canada phone access. Three vehicles are authorized to be parked in the large, paved 2 areas in front of the cabin. The lake is stocked with pink trout, year 'round, that has a mild pleasant taste, like a tender salmon. I prefer it to salmon. Your family or best friends deserve the best for their ski 'n' snowboarding, or fishing getaway to Big Bear Lake with Apple Jacks -- all polished to perfection -- as your home base. Retired couple, love to ski, surf, fish & visit family. Rent to couples & families away from home near Bear Mountain. 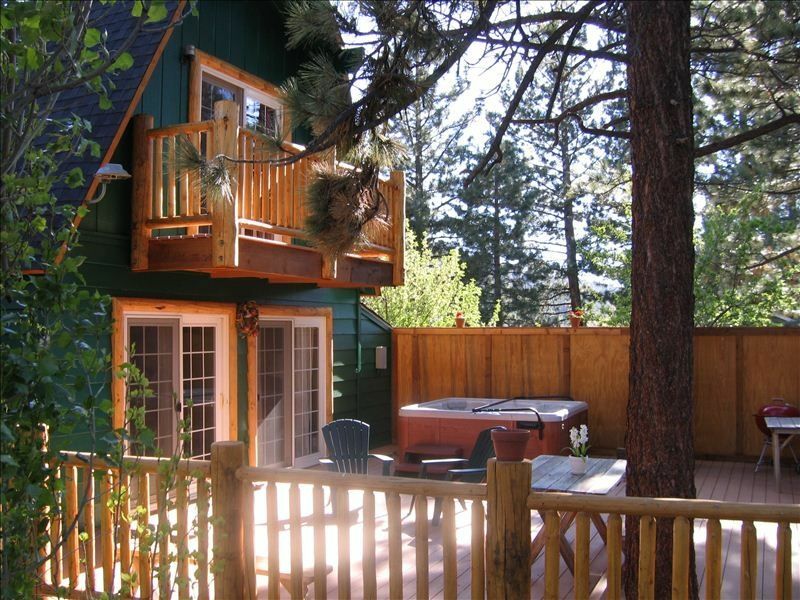 We love this comfy cabin and it's close to everything Big Bear has to offer. It's a great home away from home. Quiet neighborhood with patient neighbors & a deck & yard to play on/in. Cuddled amoung trees & cabins in a beautiful setting. Great amenities & activities within walking distance. We love to have family come visit us here. We like having a place for our pet friends too. a lovely place to walk your dog around the area and see lovely cabins, golf course, zoo & Bear Mountain Resorts. Several good restaurants on our road, too! This cabin is set back from the road in trees. While not right on the golf course, it's only a half block down the road to see the rolling greens of Big Bear Lake's nine-hole golf course & pro shop. Apple Jacks is located on a wooded lot in Moonridge. The cabin is surrounded by towering pine trees and Aspens, that turn a beautiful gold and yellow during fall. Linens and cleaning are handled by a professional, who only handles a limited number of cabins. The side-by-side front loader washer and dryer are in the first-floor den. Yes, we have free WiFi, with simple access. 46' flat TV with DVR, rock fire place & hearth bench, sofa & love seat, wood box, etc. The kitchen is actually part of the first floor 'great room,' which includes the dining and living area with its stone fireplace and large-screen TV. (3) The large screen TV in the living room offers 100s of cable channels. There are also TVs in both upstairs bedrooms. HD movie channels provided. Movie channels included. The balcony off the master bedroom overlooks the back deck and heated spa in the trees. Bring Your Own Kayak/Canoe - No garage though. Parking Lot in front yard only. Bear Mountain with free shuttles to Snow Summit is within walking distance. 4 blks Snow Summit is 5 minutes away by car. Golf Course located less than a half a mile away. There's nothing greater than slipping into the steaming waters of the large spa on the back deck after your drive up the mountain, after skiing, or after a day of hiking, golf, fishing, boating, or other physical activities. Rock Fireplace with rock hearth seat Check out the new deluxe hiking trail from the mountains to the lake that goes right by our cabin on the golf course side. It should be built soon. Can't Wait!! Walking distance to Bear MTN. Such a great weekend. Just in for 1 day to watch our Niece snowboard in a local competition. Cabin was cute, plenty of room and the location was perfect. Went to the local grocery store for breakfast items, nothing elaborate. Normal food, eggs, sausage, coffee, juice, toast. When we went to make breakfast we had to wash 75% of the dishes/pans/glasses/cups prior to using them. The Manager asked us to ensure all the dishes were washed, dried and put away prior to check out (which we did), we were asked to gather all towels, start the washer and part of the requirement is to remove all upstairs and downstairs trash, bag it up and haul it to the local trash dump location, again which we did. While we thought the price was fair for the area, I felt we did the majority of the work in addition to cleaning up after others. Overall a good experience, would suggest they tighten up their cleaning expectations. Could use some TLC but is a good value for the nightly rate. The house is a decent size and in a good location. Perfect for a small family. Check in was quick and easy. The linens (towels and sheets) are in need of updating. I did not like the security camera on the back patio. I felt uneasy sitting in the jacuzzi staring at a camera. Not very relaxing, which is unfortunate because the jacuzzi is the best part about the house. Our stay was ok, the house is just ok, could use a deep cleaning, It’s not a place we would stay again. Great hosts and cozy cabin! We were very happy with our stay here. We had never been to Big Bear before and were happy to find out when we arrived that we could just walk to the ski lifts. Claire and Robin were very easy to reach and made sure we had everything needed for a comfortable stay. The cabin was clean, cozy, and perfect for our group of friends. We would definitely stay here again! The place wasn’t really ready when we rented it. Some of the advertised accommodations were out of commission. Who doesn’t expect to receive what you paid for? So, overall it was a disappointing experience because the place was actually cozy. I gave it a 2-star rating instead of a 1/0 because when I reached out to the property’s owner, she was understanding of my concerns and tried to make sure that things get taken care of. She was kind to speak to. However, in the end, only part of it was fixed. -Big stone fireplace in the main room downstairs was very nice for getting warm and set the cozy, holiday mood. -Nicely decorated in country apple themed style - felt like grandma's cottage. There was even a small xmas tree and garland that made it feel very festive. -Great location- in a private neighborhood with lots of nature around, but not too far from the lifts/downtown lake areas. - The weather really cooperated for our late December stay- nice powdery snow! Lots of room outside for us to play and little hills to sled down. - The spa was clean and nice and hot. - Balcony in the master bedroom was nice to have. -You have to take your trash to the dumpster down the road when you leave, which is common for cabins around there, but the notice said there would be large trash bags under the sink to use but there weren't any there so we had to go buy some. -No dishwasher, cleaning service doesnt wash the dishes between renters. There is a note telling you to wash them before you leave for the next people. I didn't mind washing the dishes by hand, but I dont like having to trust that the strangers who stayed before me washed them properly. Not very sanitary. -The electricity was a little wonky- power shut off and back on a couple times. Only for a second, but was a little annoying when watching a movie. Not sure if this was the fault of the wiring or if the whole neighborhood was having issues. - The on demand didn't work on the downstairs or master bedroom TVs. Since the on-demand didnt work I tried to watch a dvd I'd brought only to realize it was bluray which the player provided doesnt play. Luckily one of my guests came up a day later and we had her bring a fire stick so we could watch movies on Netflix. - There are some snacks/condiments provided in the kitchen, which is nice, but be careful many of them are expired by several years. I know expiration dates can be flexible and wouldn't mind a couple months over but at some point I think someone needs to go through and toss the really old stuff. All in all I enjoyed my stay and would stay again! The Lake is stocked with Pink Trout all year round for fishing. Hiking & Riding Trails are abundant in nearby San Bernardino National Forest. Ride the ski lift up and mountain bike or hike all the way down!! Rent all kinds of motor & other lake crafts, water ski or paddle boat. Your choice. Ride horses in the mountains or desert. Go to the movies, fabulous shops, & Visitors Center Activities. Tubing & Sledding at Snow Play. Please EMAIL OWNER: If you want a quote and are not ready to book instantly. Please EMAIL OWNER: If you wish to rent for 30 days or more to receive our monthly discounts. Most months are $3000/month with no 11% city tax, except for December, which is $3600/mo with no 11% city tax. NOTE: If you <Book It> for 30 days+, we will REMOVE the city tax of 11% from your balance before charging your card.